Since Google brought out Google Docs several years ago I have made just a few half-hearted to use it in class. I have been a Microsoft user since the early 1990s and the "Old Dog" in me will not change over to Google Docs at this stage. However, some of the collaborative features of Google Docs offer many opportunities for use in class - many educators at all levels have been doing so for years. Last evening in a Statistics class I introduced the topic of Probability. Usually I start this out in a simple experiment by asking the students to toss a coin 20 times and record the number of heads (H) and tails (T). In a second experiment I ask students to work in pairs and to toss two coins 10 times and record if the result is HH, TH, HT, or TT. In the past I would write down the results on a whiteboard, but in large classes I would only take a few results resulting in many students' experiment results not being recorded. I would then have the job of manually calculating the average scores from the whiteboard. 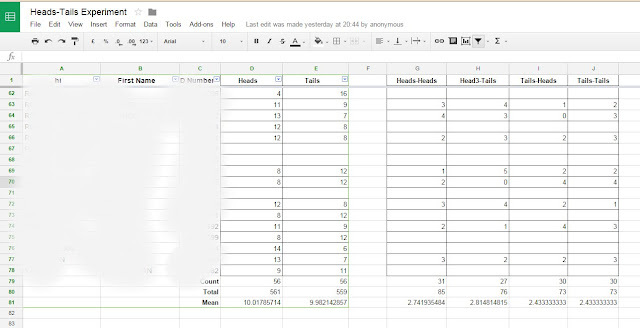 Using Google Docs I set up a spreadsheet in advance of class to record the results, and shared this through a link in Moodle. 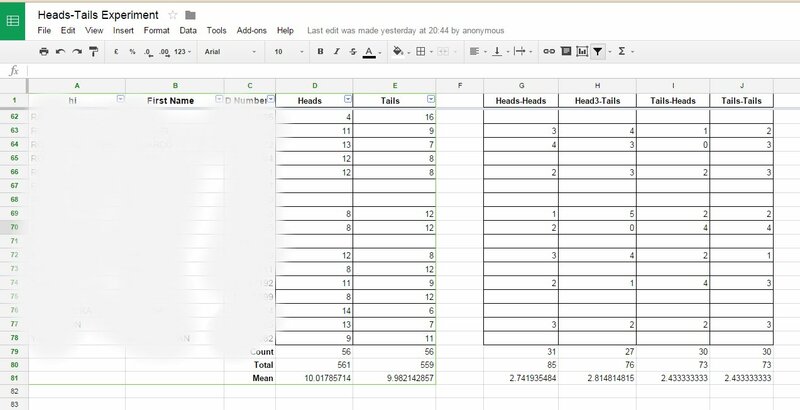 Each student was listed by name and number - so they could easily input the results for their own experiment onto the spreadsheet. I had also set up the formulas for calculating the class averages. While there was obviously some errors inputting results - this approach worked well by getting all students to participate, and saving me a lot of time and bother by preparing in advance. Below is a selection of (anonymized) data from last nights class - now to think of other opportunities to do the same.